She was born in Buffalo, NY. She is accomplished in the area of Community. 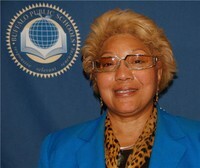 Paulette Woods is the Central District Buffalo Board of Education Representative She has been a homeowner and resident of the Ellicott/Central District for over 26 years. Mrs. Woods has 32 years of experience working as a Senior Budget Examiner for Erie County. She has worked with five County Executives and other county administrators to help manage Erie County's 1.5 Billion-dollar budgets. In additional she served as CFO chief financial officer for the Erie County Youth Department, and for Erie County Youth, Detention and Probation Departments. Ms. Woods is a veteran of the United State Military having served 6 years in the 402nd Civil Affairs Battalion (Airborne) and 2 years in the inactive reserve. She served in the United States Army Reserve 1987 - 1993 has eight medals and ribbons with 3 overseas deployments in Germany and Guantanamo Bay, Cuba and is currently the Commander of the American Legion's Jesse Clipper Post #430. Paulette Woods has acquired a B.S. in Accounting and Business Administration, and a M.S. Degree (SUNYAB) in Public Administration -ABD. She is family and community -oriented. Paulette Woods helped to educate and tutor eleven younger brothers and sisters; many of whom have gone on to secure undergraduate and graduate degrees to further their professional careers. She has been an advisor, mentor and role model to her nieces and nephews who have attended or now attend Buffalo Public Schools. Her Memberships and Associations include: N.A.A.C.P - Silver Life Member; Commander American Legion Jesse Clipper Post#430; Black Chamber of Commerce- Executive Committee; National Association of Accountants; Licensed Evangelist and Trustee Board Prince of Peace C.O.G.I.C. , Licensed, ordained minister (Ephesus Ministries) 2010; We Are Women Warriors Family Empowerment Group; Alpha Kappa Alpha Sorority; Outstanding Young Woman of America, 1984; Treasurer- Erie Niagara County League of Women Voters, 1997; B.U.I.L.D of Buffalo. Ms. Woods is also a City of Buffalo University Committee woman, Zone Officer and serves on the Executive Committee of the Erie County Democratic Party. Paulette Woods is a member and ordained Elder at Fellowship World Church, under the pastoral leadership of Rev. John Young founder of Totally Gospel 24/7 Radio A.M. and F.M. and Television ministry.